I first came across this quote at the tail end of my career in the (British) television business, uncredited, on a scrap of paper left by a photocopier, long before it was simple to share things on the internet. I was disillusioned with television at the time, which was being casualised and commoditised around me, so it struck a chord. Since then, I’ve seen it reappear from time to time, sometimes referring to the music industry instead. Well, there’s always someone on the internet who’s more obsessive than you are, and it turns out that most of the quote comes from an article by the gonzo writer and critic Hunter S. Thompson originally in the San Francisco Examiner in 1985, republished in 1988 in his collection Generation of Swine. 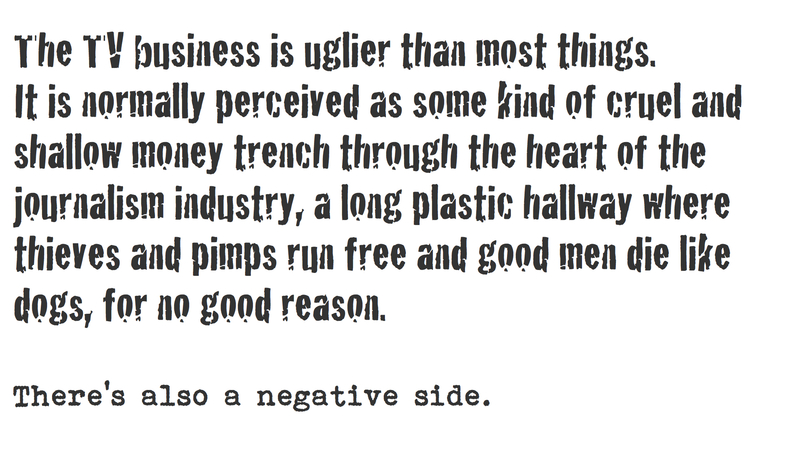 But the last line – “there’s also a negative side” (set-up, pay-off) – was added later by someone else. But it’s a good joke which also captures well the egoism and the vanity of the television business.